In 1964 Hess introduced its line of Hess Toy Trucks at their stations which would end up becoming one of the most popular ideas of its time. 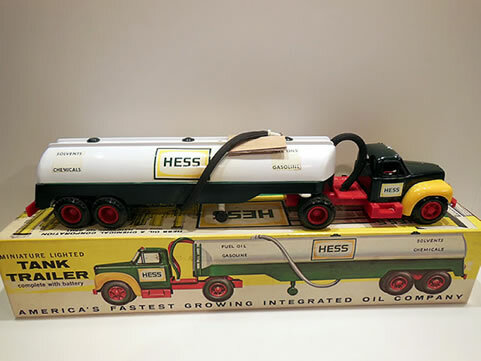 They paved the way for all the other oil companies to start coming out with their own toy trucks as well but none were more popular than the Hess toy Truck. Here in this article you will be able to see side by side pictures of the similarity between the Hess and Shell Oil Company promotional toy tanker. The Hess tanker was produced by the Marx Toy Company who already had built up their reputation for the most well built and popular toys that children played with over the years. 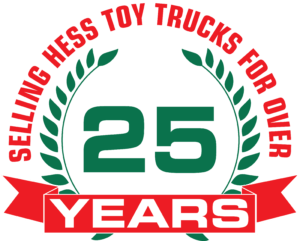 Hess always insisted in the very best detail and that is why right up to today they are the best quality and most durable plastic toy trucks ever made. The 1960s Shell tanker was produced in Hong Kong by a company called Jimson. Jimson produced many small plastic toys throughout the years one of which was a vintage and rare Shell Tanker Truck which featured a chrome plated front bumper & hubcaps along with friction powered front wheels. Below are some picture comparison shots so you can judge for yourself how amazingly close they both are in detail. The Shell tanker is available for sale on our website. Click link below to purchase yours today!